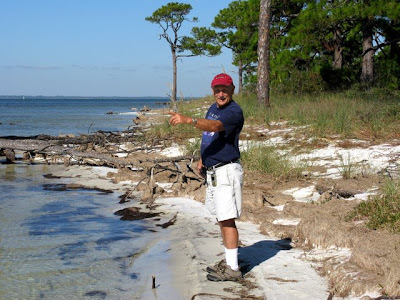 St. George Island, in the Gulf of Mexico, is about 3 miles due south of Apalachicola. 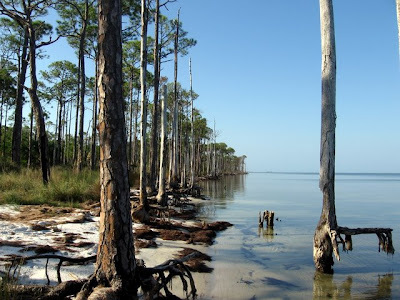 One of the barrier islands off the coast; it is one of our favorite state parks. 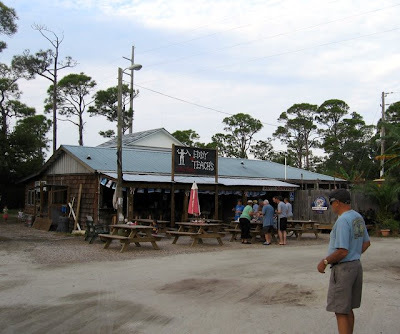 We drive 3 miles across a causeway and go to the east end of the island. 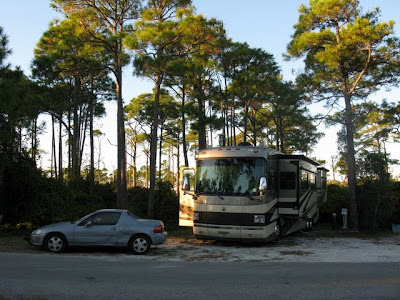 Here you come to the park entrance, then drive another 5 miles to the campground. The spaces are long and wide, and the park has hiking trails, and miles and miles of private beaches. 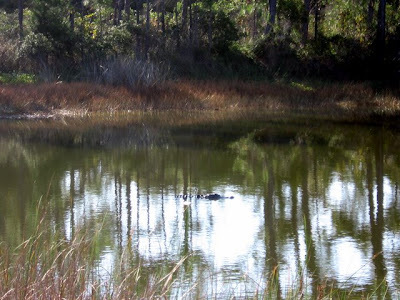 St. George Island even has a resident aligator! 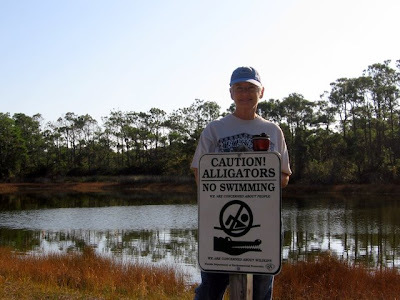 The aligator pond is right near the corner when you turn into the campground. Dogs and cats beware! Since it is late afternoon on Monday when we arrive, we spend a little time cleaning up, have our dinner, then call it an early day. The next morning, more cleaning, and then find the moment of truth: no air card signal = no surprise! At least our cell phones work with only a couple of bars. 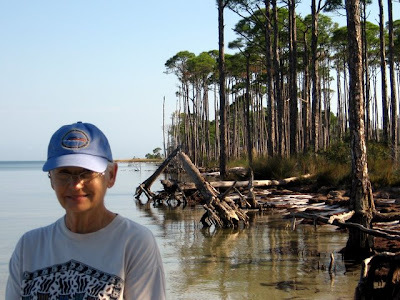 Early in the afternoon, we take about a 5 mile hike on the nature trail over to Apalachicola Bay. When we get back to the coach, dear friends from Arizona, Mike and Karen Forino have parked right next to us in their coach. 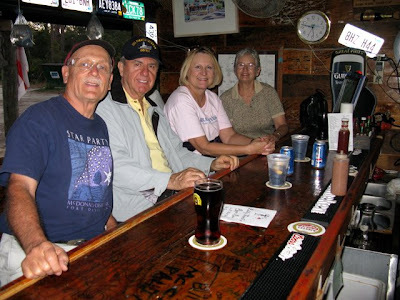 These lucky people are enroute to southern Florida to catch a cruise ship for a 33 day tour beginning on or around November 20th. Mike is a computer techie, and has a wireless network in their coach. He allows us to connect to their network which allows me to get our email, faxes, and publish this post. I hate getting so far behind on the blog. We also get to meet their new kitty Magic. Magic Forino is a follower on our blog. Hey, where is it written that you have to only have 2 legs to be a follower? I think followers with whiskers and tails are just fine, thank you! Now I'm hoping a dog will sign up. Fair is fair, no? Next big decision: dinner. We remembered a place where all the locals go on the island. So we climb into the Forino's car and take off for Eddy Teach's Raw Bar. 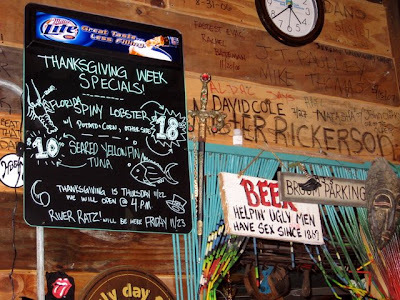 With the economy in a nose dive, the nightly special has the right price! Of course the dark beer on tap was a different matter, but hey, we're on vacation! The above picture taken last year on our visit was in better economic times. But I thought you'd enjoy the signage about the virtues of beer. Having no shame, the bar tender takes a picture of the four of us. Mind you, we were at the best part of the bar. A family institution, many people eat at the picnic tables out in front, where the kids are allowed. Some of the decorations inside might be a tad embarrassing to explain to the kids. 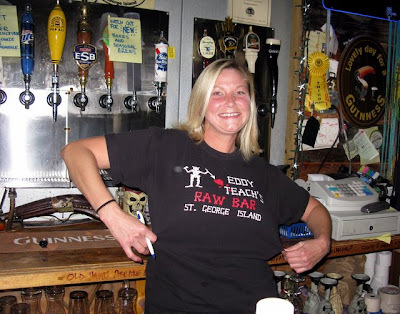 It's all in good fun, however, and the bar tender proudly shows off her t-shirt. 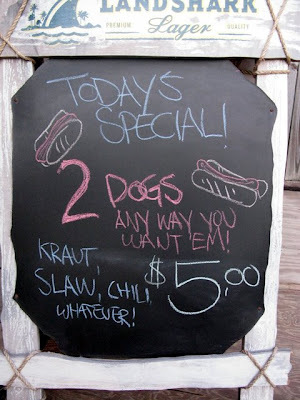 Hey, in a down economy, you do what you have to do! Tomorrow we promise ourselves a walk on the beach. Tonight, it's off to bed early. Old people! Nice blog; great pics. I recognized Mike & Karen Forino. I'd like to say hello & get in touch. Tell them it's Debbie Demeritt from the Hubot days! Contact Mariedcovert@gmail.com.